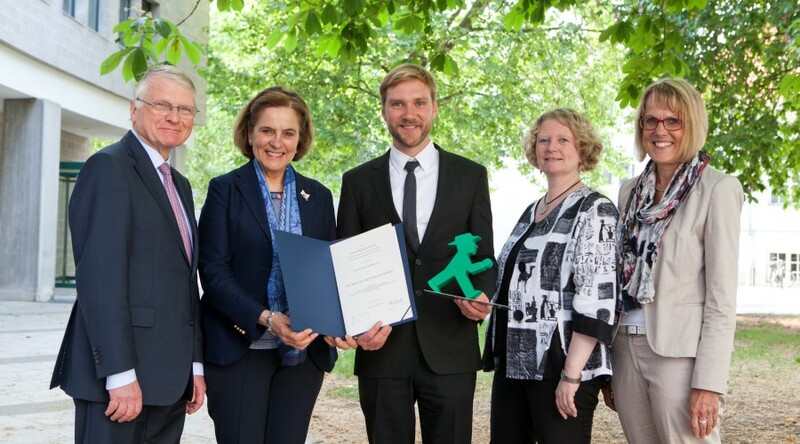 With the 10,000 Euro Kind-Philipp Prize, the Kind-Philipp Foundation showed their appreciation for Dr. Klusmann’s research work at the Hannover Medical School (MHH), which focuses on a specific form of blood cancer in children. The award ceremony took place during the 85th meeting of the Society of Pediatric Oncology and Hematology (GPOH) on the 29th of May in Berlin. The prize is awarded each year by the Kind-Philipp Foundation for the best scientific work on childhood cancer in the German-speaking world. For this purpose, a GPOH expert committee reviews the applications. Walter Reiners started the foundation in 1972, after his son Philipp died from acute leukemia. The foundation promotes basic research for a better understanding of leukemia and childhood cancers. In four papers, Dr. Klusmann and his team have described new findings on the development of leukemia. Among other things, the researchers showed that in a form of pediatric blood cancer (acute megakaryoblastic leukemia), a cluster of microRNAs on chromosome 21 promotes the growth of leukemia cells and thus disrupts normal blood formation. The findings help expand our view of the interplay between genes in leukemia, and will thereby contribute to new solutions in biomedicine. In the future, Dr. Klusmann plans to improve therapies against childhood leukemias. So far he has developed a novel treatment option for children with Down syndrome myeloid leukemia, with first treatment success already achieved.